A leisurely yet exciting design, the 18 hole golf course offers an escape from the hustle and bustle of the fast-paced technological era into a natural sanctuary steeped in the spirit of the graceful oaks for which the course is named. Golfers looking to get away from the rigors of the office and the city can make a short drive east on I-20 to exit 88 to enjoy the charm of southern hospitality and experience golf the way the legendary Bobby Jones envisioned it. Whether you wish to host a group outing, tournament, charity or corporate event, our experienced staff is trained and ready to help make your event a success. Thanks toour beautiful course and exceptional staff we are currently the proud host to many community charities, corporate events, and local and regional championships including a USGA Pub Links regional qualifier. 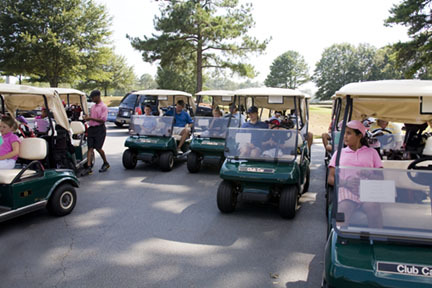 Contact us online for more information on Group Events and Tournaments or call 770-786-3801 ext. 3. There is a wide variety of formats to choose from for your event. However, to ensure your success we recommend the "Scramble" formatas it results in the best pace of play, is less confusing and is fun for all skill levels. Whatever format you choose it is very important to remember..." keep it simple".